The PlayStation VR had originally been scheduled to launch in the first half of this year, but Sony will wait until later this year to ensure there's a broad selection of VR games and enough headsets to avoid shortages, said Andrew House, president of CEO of Sony Computer Entertainment. He was speaking at an event on the sidelines of the Games Developers Conference in San Francisco. The headset will cost US$399, €399, £349 and ¥44,800. That's a good deal cheaper than the competing Oculus Rift headset, which will cost $599, and the HTC Vive, which will cost $799 bundled with accessories. Both are due on sale later in 2016. 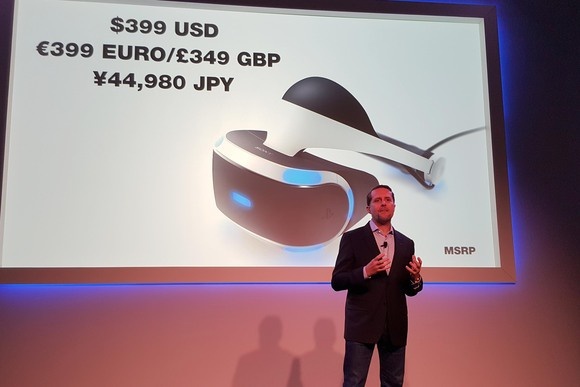 Andrew House, president and CEO of Sony Computer Entertainment, announces the PlayStation VR price at event in San Francisco on March 15, 2016. At the event, I had the chance to try out the PlayStation VR and a few of the VR games under development. The headset is lighter than it looks and fit comfortably on my head, even with my glasses on. The first job when slipping it on is adjusting it up and down so the center of the screen is in the center of your field of vision. The display can also be moved closer or further away from the user. Once set up, just slip on a pair of headphones -- they aren't integrated into the headset -- and fire up some games. 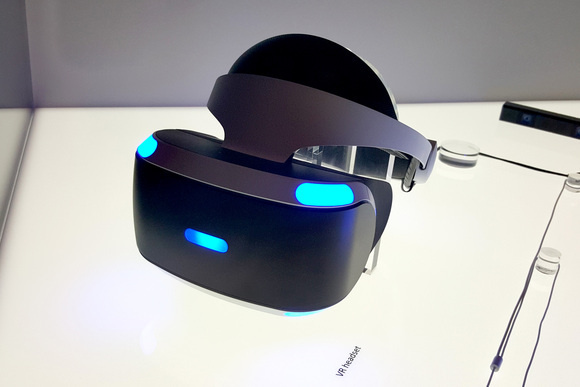 Sony's PlayStation VR headset on show in San Francisco on March 15, 2016. In one game I tried, Battlezone from U.K.-based Rebellion games, I piloted a tank around a futuristic battlefield, shooting at other tanks and firing at aircraft. I could look around the inside of my tank and see other displays, panels and switches and look around the virtual one. At one point, I was craning my head upwards to try and spot aircraft above. As I got into the game, it was easy to suspend reality and the entire experience felt much more immersive than a conventional game on a TV screen. 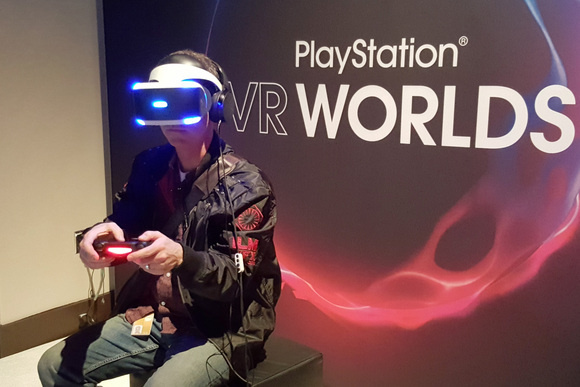 Someone plays a PlayStation virtual reality game at a Sony event in San Francisco on March 15, 2016. The PlayStation VR features a 5.7-inch OLED display with 960- by 1080-pixel resolution. That's good enough to enjoy the games but still falls well short of real life, so you'll still be able tell you're in a game. Sony says there's an 18 millisecond lag between movement and it appearing on screen -- fast enough to make everything seem real and that was certainly the case when I tried it out.